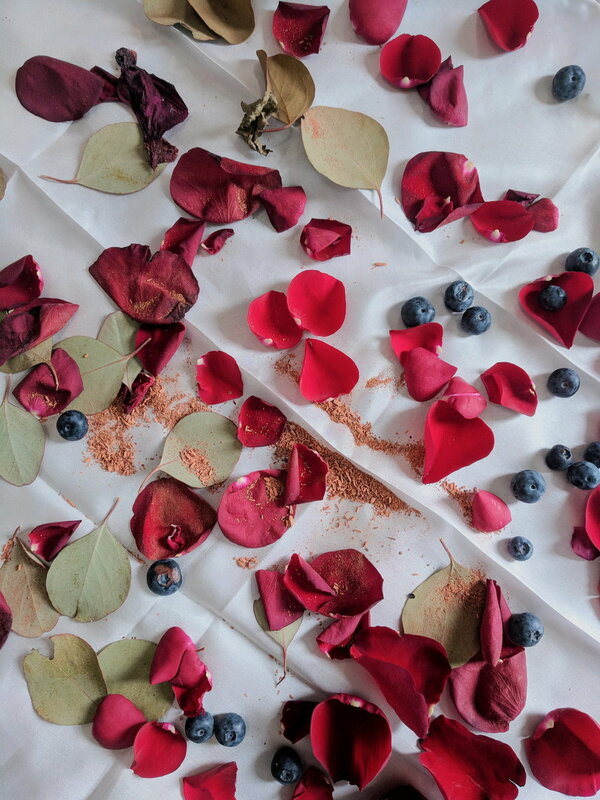 Let’s celebrate ~spring~ by experiencing the natural extraction of color from assorted flowers, plants, fruits and tree barks to create your very own one-of-a-kind silk neck scarf! You'll learn about the amazing benefits of silk fiber, the ins and outs of the botanical materials and their respective coloring, and how to bundle it all up with a mordant and steam it to seal the deal. The outcome will be a wide array of organic, unique, and multi-colored prints. While the steaming takes place for two hours, attendees are encouraged come pick up the bundled piece at the studio the following day. *Feel free to collect and bring wildflowers to bundle as well as another silk ware to dye! Kylee received a BFA in Graphic Design from SCAD, but when she accepted a visual design job at IBM after graduation, imposter syndrome was smothering her self-confidence, self-worth and passion. Recalling the comfort she felt from her silk trimmed blanket as a baby, she then utilized her passion for self-expression and color theory to create a brand of silk products that shine light on the issues women face in the workplace. Learn how to extract natural color from assorted flowers, plants, fruits and tree barks to create your very own one-of-a-kind silk! In this workshop you'll learn the health benefits of silk fiber, the ins and outs of the botanical materials and their respective coloring, and how to bundle it all up with a mordant and steam it to seal the deal. The outcome will be a very organic, unique, and multi-colored print on a silk scarf. While the steaming takes place for two hours, attendees are welcome to leave and come pick up the bundled piece at the studio the next day. Kylee received a BFA in Graphic Design from SCAD, but when she accepted a visual design job at IBM after graduation, impostor syndrome was smothering her self-confidence, self-worth and passion. Recalling the comfort she felt from her silk trimmed blanket as a baby, she then utilized her passion for self-expression and color theory to create a brand of silk products that shine light on the issues women face in the workplace. Are you ready for spring and looking for yet another reason to buy more plants? 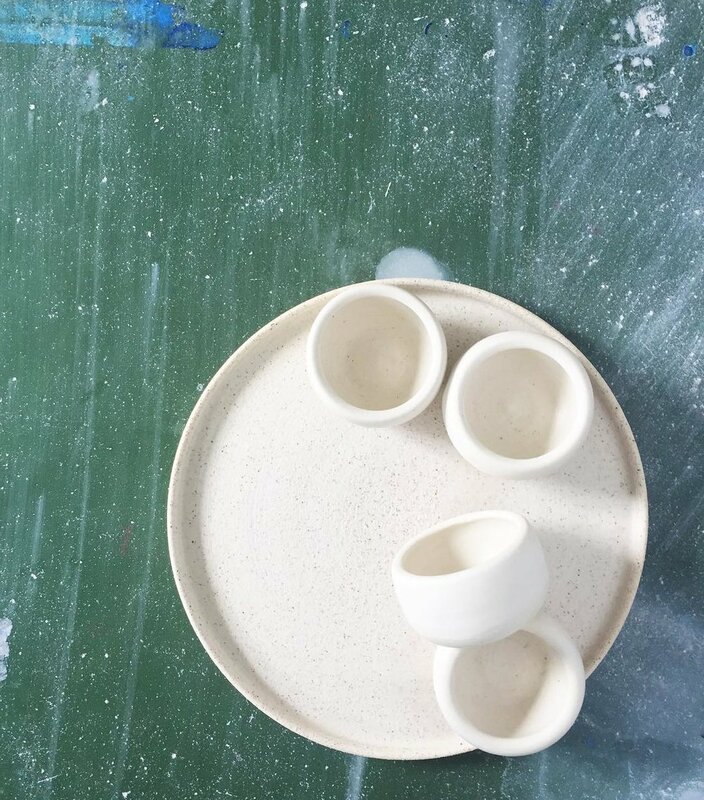 Have you seen Ghost and been dying to try pottery ever since? If your answer to one or both of the previous questions was yes, look no further! 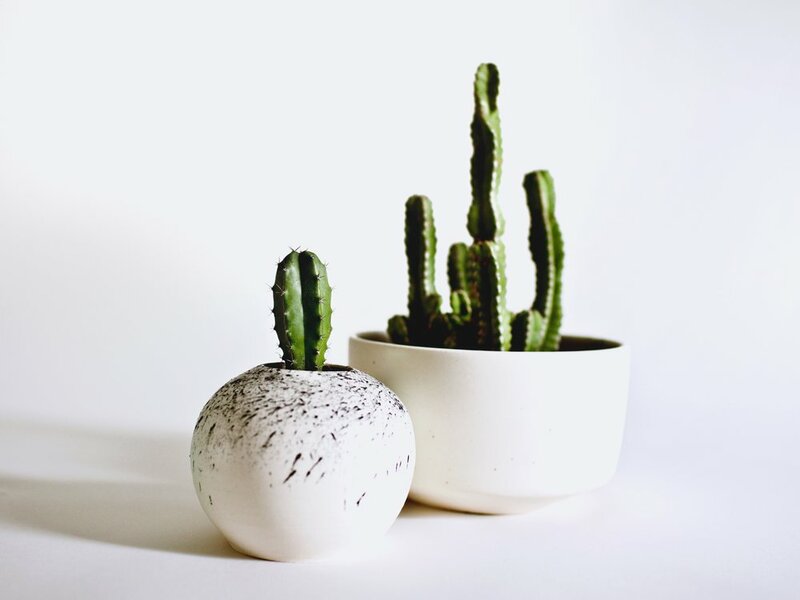 In this beginner-friendly workshop, you will learn the basics of hand building and create one medium or several small planters for all of the amazing plants you can't stop buying! 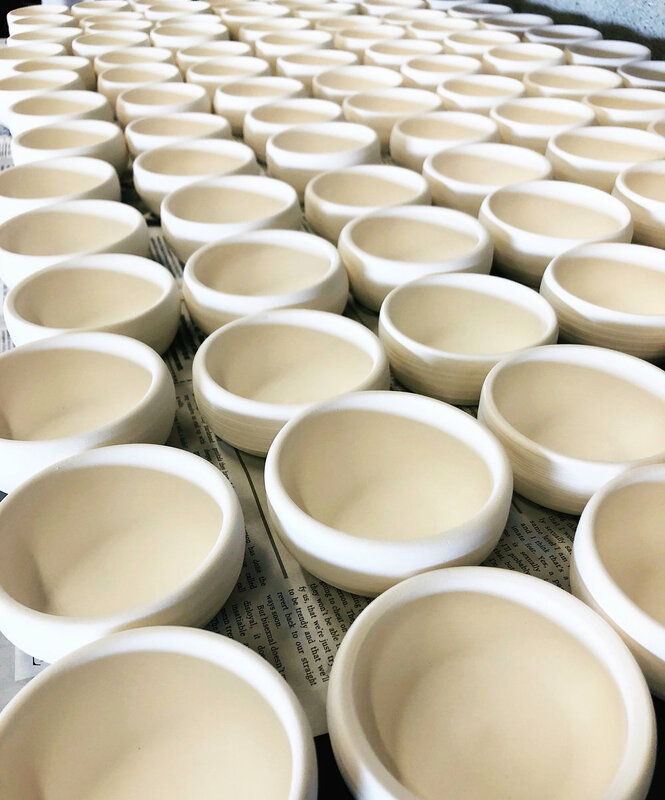 Each piece will later be bisque fired, then glazed with a non-toxic clear glaze and ready for pickup 1-2 weeks after the workshop. Materials, snacks, and beverages provided. No green thumb required. Hope to see you all there! Join honeysuckle for an interactive tea party that includes refreshments, cupcake decorating & complementary cocktails! Grab your gal pal & learn a new skill! 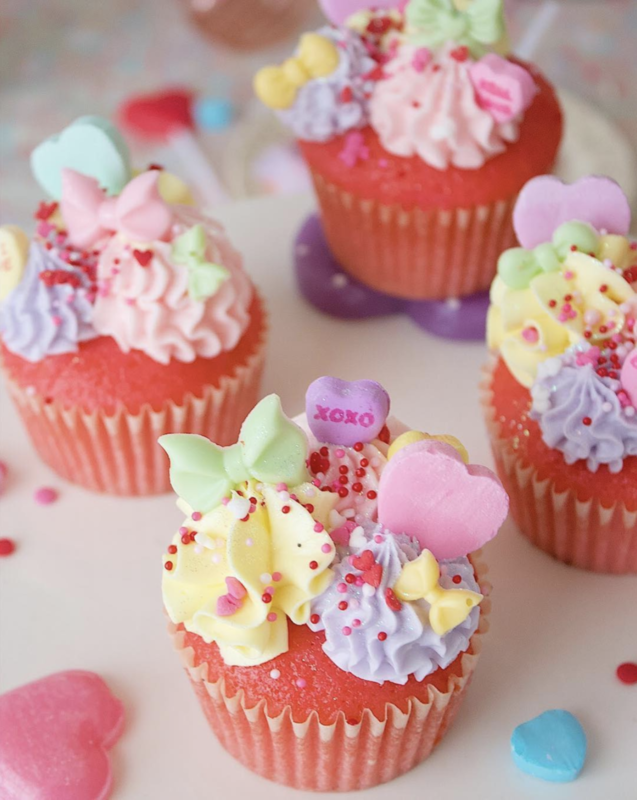 Sara's Creative Cupcake Class will teach you how to make beautiful & gift-worthy creative cupcakes that are as amazing to look at as they are to eat! Leave with cupcakes to share with friends & goody bag filled with Sara's favorite sprinkles & toppings to make your own honeysuckle creation at home. Chef & owner Sara Lauren Hinojosa worked in fine dining & art galleries in NYC before combining her love of food and art in her dessert creations at honeysuckle. 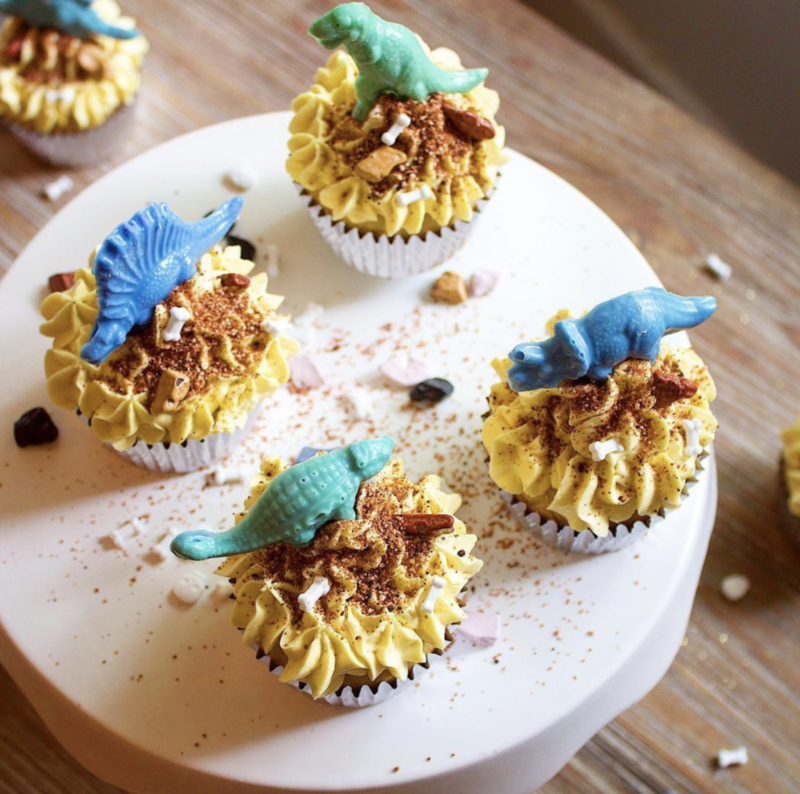 She seeks to create desserts that are as surprising & fun to look at as they are to eat. Want to add another medium to your already awesome arsenal? Learn all about gouache paints: the glorious love child of watercolor and acrylic! In this workshop, you’ll learn what makes gouache so special, how to use it, and get some practice in on a design of your choosing. You’ll receive your very own set of gouache paints, brushes, and a palette to get you started, as well as two hours of instruction from a gouache-aficionado. Whitney Batres is a visual artist who currently resides in Austin, Texas with her husband and their cat, Karen. In 2015, she graduated with a BFA in Studio Art from the University of Texas at Austin and stuck around for the people and the food. She loves thinking up new ways to combine her favorite mediums and materials, and draws inspiration from familial and cultural traditions of domestic craft. Taught by Kara Pendl of KARACOTTA! Do you love whiskey, espresso or tequila? Are you curious about the wild world of ceramics? Do you want to gift someone the best house-warming present ever? If you're shouting "YES," the grab a spot in this beginner-friendly workshop! You can expect to quickly learn the basic fundamentals of ceramics and then we will start with a no-experience-needed pinch pot technique! To complete your pieces, Kara will kiln fire them and you will be able to pick them up from Broad Studios two-three weeks after class. It's the most wonderful time of the yeaarr! 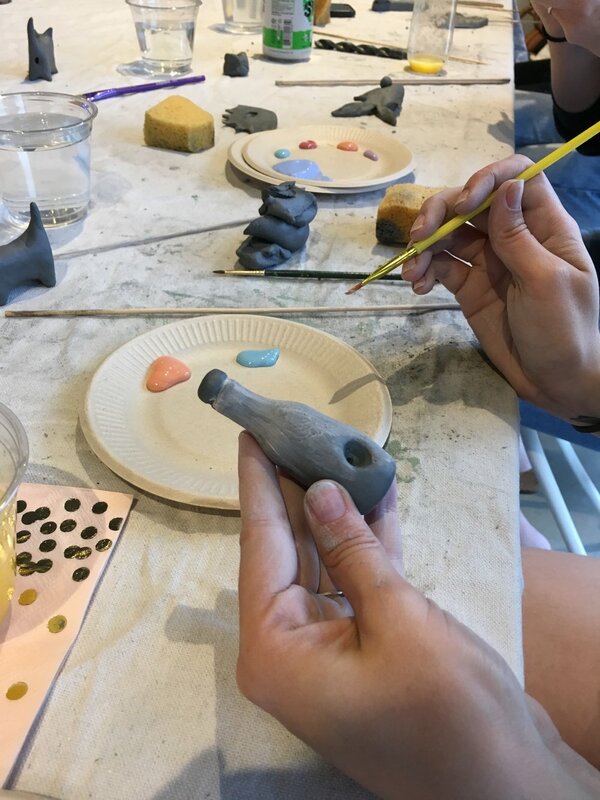 That's right, let's 420 glaze it together in this ceramic pipe-making workshop hosted by Genna Williams! In this course, you will learn the basics of hand building and the fundamentals for a successful smoking device. 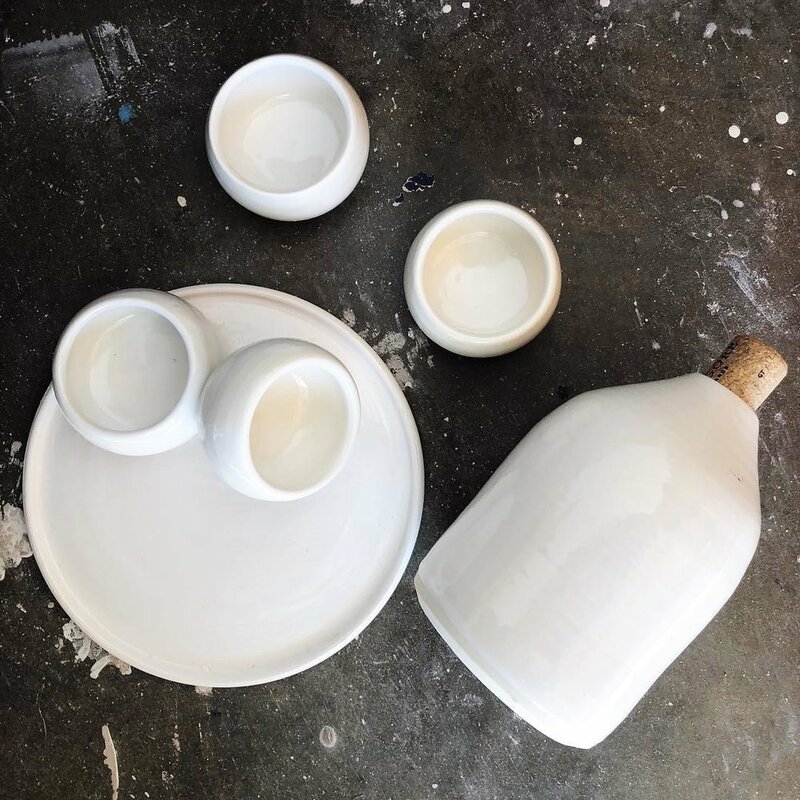 You'll be able to make several small, or one larger piece that will be fired & glazed with a non-toxic clear glaze and ready for pickup 1-2 weeks after the workshop. Materials, munchies, and gentle words of encouragement will be provided. Let's celebrate this joyous day by makin' pipes, makin' friends, and makin' Martha Stewart and Snoop Dogg proud. Hope to see you cool cats there! South By Southwest (SXSW) is upon us, which calls for the inaugural year of BROADS BY BROAD STUDIOS aka BXBS! Whether you’re hiding for all of SouthBy or you’re in the throes of planning your daily itinerary, come support your local broads! BXBS will take place on Saturday, March 9th from 12-5pm at Broad Studios at Springdale General. We will be spotlighting five of Broad Studios' resident artists as well as a curated selection of 16 additional Broads we love for a fun, handmade shoppable experience. Join us! In addition to our vendors, we’ll be serving drinks at the inside bar, Gati by Thai Fresh food truck on site as well as activations by Sound Sight Tarot, DJ Cassandra, and a green screen photo booth by Jelly Booth LLC. This will be a stop you won't want to miss! Taught by Ellen Bruxvoort of FIBROUS! Doors open 10 minutes before the workshop and close 10 minutes after we begin. Doors open 10 minutes prior to the start of the class and close 10 minutes after we begin. 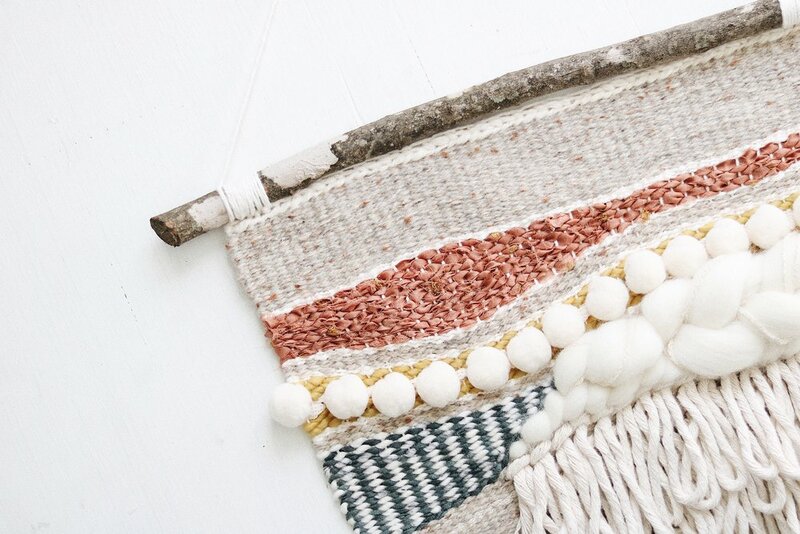 In this workshop, we will create a unique woven wall hanging from start to finish. This is a great introduction to weaving, as we will be working on a 7x8" loom and your entire piece can typically be finished in one sitting. All materials are included, however you can bring your own yarn if you have something specific you'd like to use. 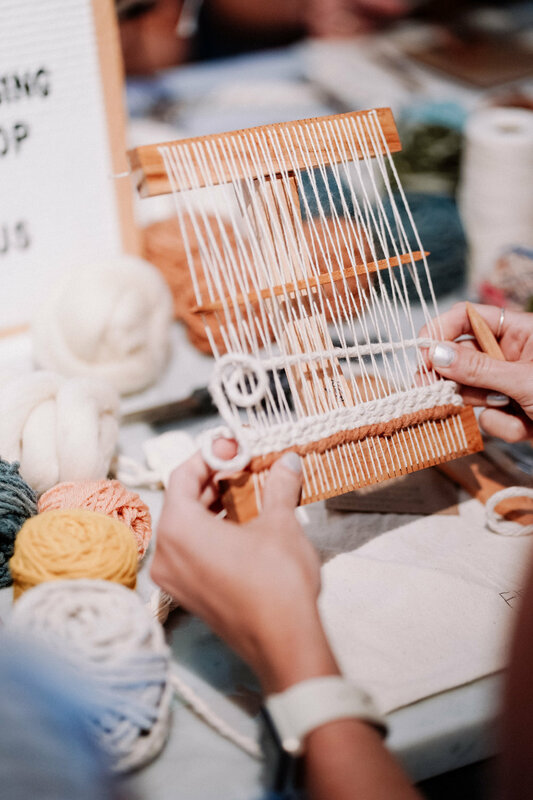 We'll walk through all the basics of how to weave with examples of different stitches, adding fringe, and attaching a dowel. This project has unlimited possibilities for customization, it's great for gifts, and requires no prior experience with weaving. At the end of the class, all students will leave with their finished piece of art and all contents of the kit (including written instructions) to continue the fun at home! Ellen studied graphic design and advertising at Austin Community College and the University of Texas at Austin, but ultimately left school in 2014 to work on an organic produce farm in Hawaii. When Ellen returned from the farm later that year, she turned to weaving as a new creative outlet and pursued it for 3 years before making it her full-time job. Today, Ellen works with mostly wool, cotton, linen, hemp, and copper to create wall art, functional goods and fiber jewelry for shops and individuals all around the world. View more of her work at www.fibrousatx.com or @ellenbruxvoort on Instagram. 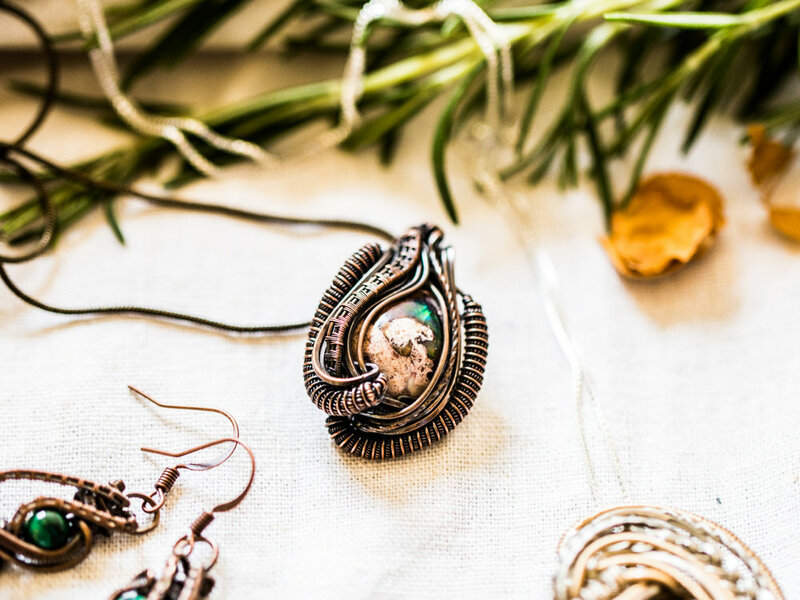 Come and learn the ancient technique of wire-wrapped jewelry! In this class, Marlena will teach the basic beginnings of wire wrapping. Learn what type of wire and tools are used, how to create a frame to hold stones, and go home with your own wire wrapped crystal necklace, made by you! She will provide wire, tools, and the first crystal but you're encouraged to bring other stones from home, to wrap if there's extra time! Marlena will have affordable kits available for purchase if you'd like to continue practicing at home. Marlena is an artist who has been making jewelry since 2014. She lives and works in her off-grid home in the Texas hill country, surrounded by open air and plenty of inspiration! You can find her on Instagram @marlenajarjoura or at www.marlenajarjoura.com. 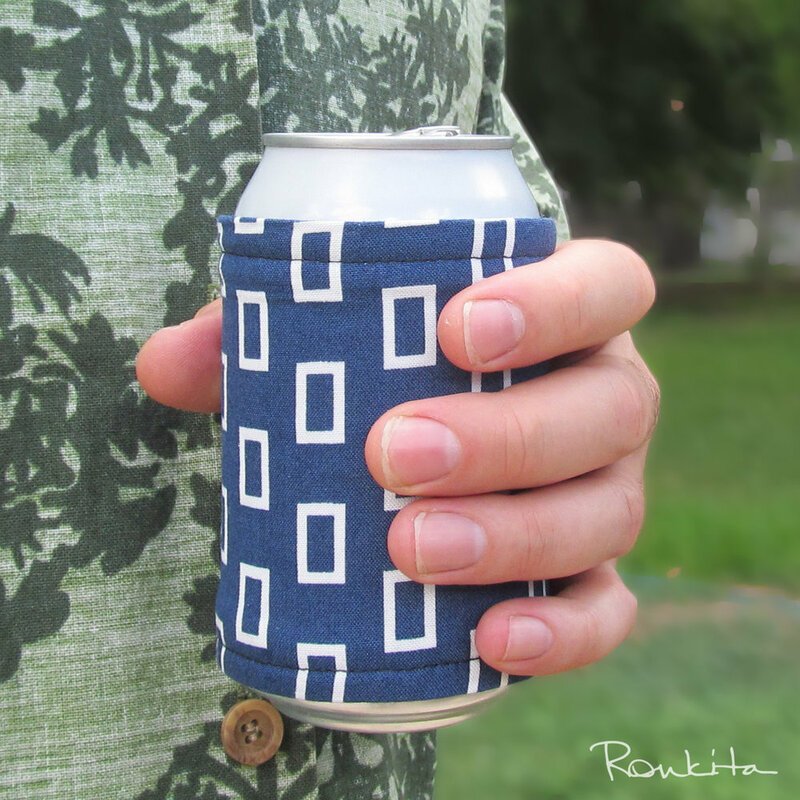 Taught by Vanessa Villalva of Ronkita Custom Sewing and Design! If you're curious about sewing or just want to have a good time making something for yourself, this is the class for you. In this beginner-friendly workshop you'll get hands-on experience with a sewing machine and learn to sew a project of your choice. At the start of the workshop, you'll select one of the projects to make and take home with you - small tote bag, drink cozy, clutch handbag, or drink coasters. Sewing machines and a variety of fabrics are provided so you don't need to bring anything. Taught by Mindy Sepeti of Mindy's Bakeshop! 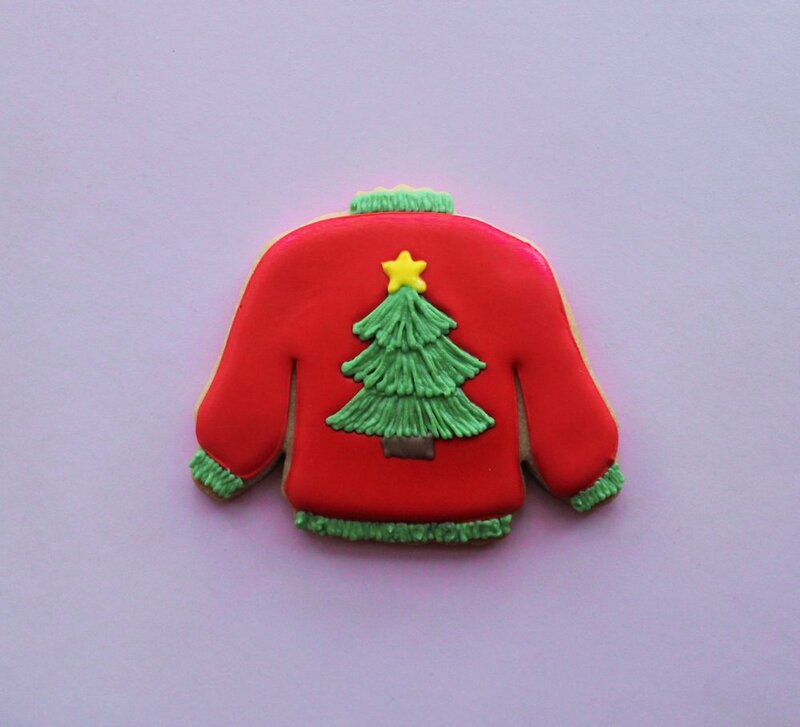 Kick off the holiday season in style and join us for the sweetest ugly sweater party ever! Mindy will take students step by step through the process of decorating sugar cookies with royal icing, no experience necessary. They'll learn how to outline, flood, and detail cookies using multiple techniques and materials. 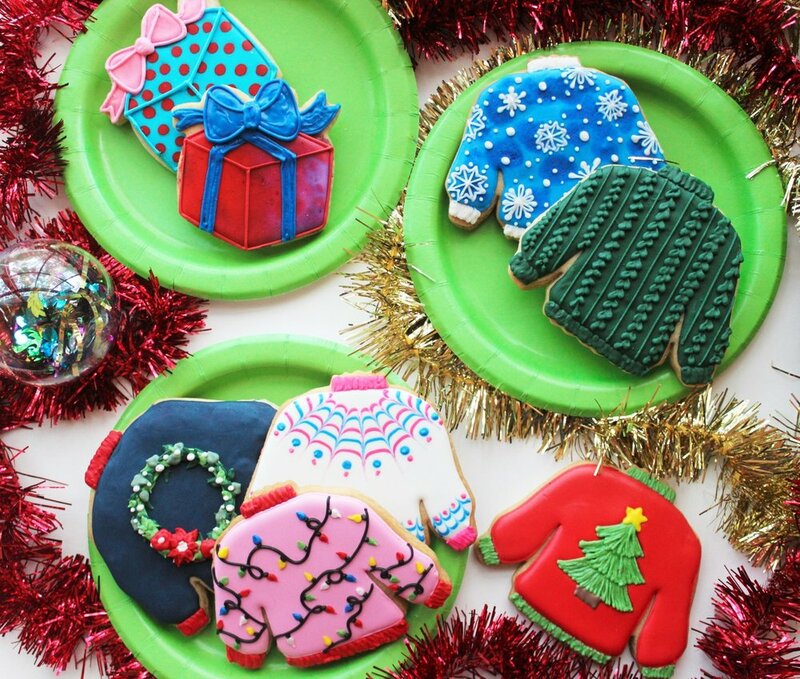 Each student will leave with a box of 10 decorated cookies, a packet with Mindy's favorite sugar cookie and royal icing recipes so you can recreate everything at home, and a list of favorite tools that will help you achieve professional results every time. Mindy Sepeti is one half of Mindy's Bakeshop, a home-based bakery specializing in custom cakes and decorated cookies that taste as good as they look! Together, her and her husband strive to create nothing but the very best for their clients. They spend their days in the kitchen, covered in flour, singing Michael McDonald songs and they wouldn't have it any other way! 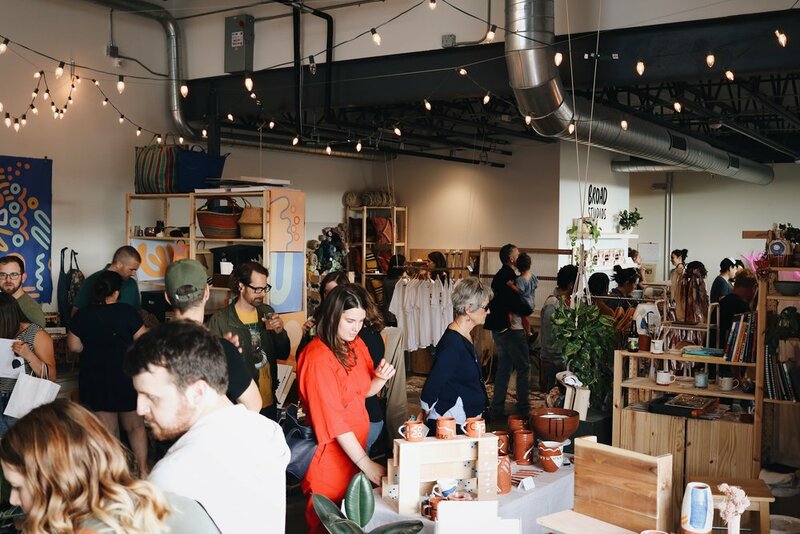 Big Medium's East Austin Studio Tour (EAST) is a free, annual, self-guided experience spanning across the second and third weekends in November. The tour provides a unique opportunity for visitors to view and purchase art, meet the artist, and see where the work was made. With thousands of attendees from all over the world, EAST will open to the public this November 10-11 & 17-18 from 11am-6pm and Broad Studios will join the tour as a collective for our first time! In addition to our 6 resident artists, Broad Studios will be hosting a total of 15 additional artists with different artists each weekend, which means this will be a stop you won't want to miss. Sponsored by Thirsty Planet Brewery, Tito’s Vodka, and Chameleon Cold Brew. An exclusive East Austin Studio Tour preview of our studio space: see our production practices, speak with us about how we have opened doors in our respective mediums, and how we support one another in collaboration. In this workshop you will learn how to create your own unique marbled papers and then transform one into your own mini sketchbook or journal. You will learn some marbling techniques used by the masters, have fun experimenting on your own, and learn some basic forms of book binding in order to create our journals. All the materials will be included, and you’ll leave with a handmade journal, and a list of materials you would need to continue marbling at home. Taught by Melarie Odelusi of Mauve Paper Co! Come and learn the basics of hand lettering with Melarie from Mauve Paper Co. We will begin with a crash course in the anatomy of type and will learn to draw freeform letters with a variety of drawing instruments while exploring composition ideas. Students are encouraged to class with a word or short phrase that they would like to illustrate. Alls students will receive a alphabet lettering guide and 5X7 print from Mauve Paper Co's Fall Collection. No previous lettering experience is required. All necessary supplies will be provided. I'm Mel, the colorful heart behind this God-given gem, Mauve Paper Co. You can find me creating hand lettered and illustrated paper goods to capture life's magical moments in minimal art form. If I am not creating, I am loving on my husband and chasing my children around, more than likely grabbing my art supplies out of their little hands. I enjoy sharing my craft with people who enjoy art in every aspect of life from the stationery they send to their friends to what they hang in their office or creative space. Find more information at www.mauvepaperco.com! Small Talks is a series of intimate events that offer first-hand views of small, local businesses in Austin. In October we’ll be visiting Broad Studios. Broad Studios is a female artist collective based in East Austin split evenly between six resident artists. 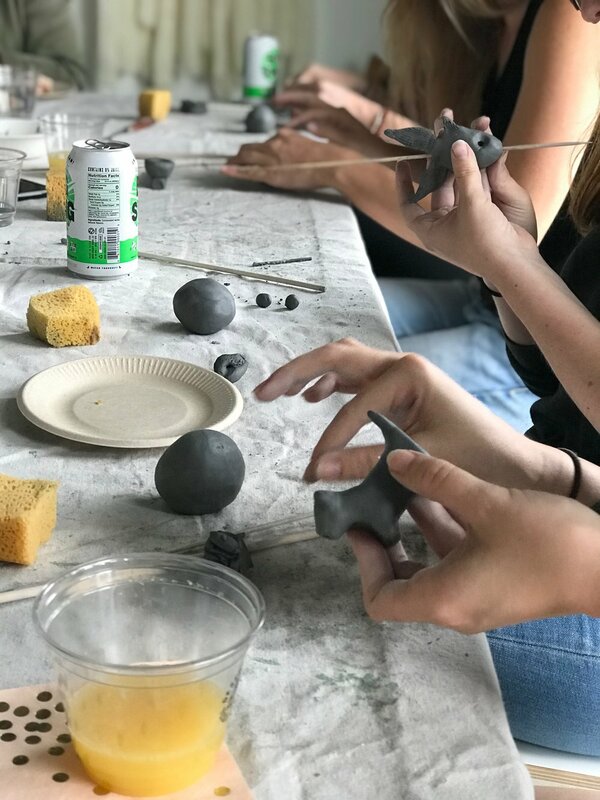 The studio is mainly a closed working space on a daily basis, but the ladies at Broad Studios also offer craft-based workshops of all different mediums to the public. During this event, you’ll hear from the six artists that started Broad Studios including Ellen Bruxvoort, Kylee Barnard, Kara Pendl, Hallie Shafer, Genna Williams, and Emily Eisenhart. They will discuss what it’s like to start an all female artist collective and what inspires them and their craft. We’ll be projecting this magic on the wall with drinks and snacks to go around. Feel free to BYO as well (we have a fridge!). Limited space available but don’t let that deter you from showing TF up. DEADLINE TO REGISTER TO VOTE IN TEXAS WAS OCTOBER 9TH. Early voting starts on 10/22! Election day is 11/6! Don’t miss it. Abby Mechanic received her BFA from the Maine College of Art with a concentration in Woodworking and Furniture Design. Upon graduating she has spent time working in various design studios such as Luur Design, Nate Berkus, and Matter Practice. In 2015, Mechanic began working at Parsons as a Technician in their woodworking facility. Since then she has assisted in the 2015 New School Architecture Design/Build, and has most recently been appointed the position of Manager of the Making Center at Parsons. Abby is now working closely with upper management to implement administrative support for staff hiring, scheduling, and committee work. She works with Directors as well as Management to align Making Center objectives across all shops, labs, and facilities, by creating systems and support. Outside of Parsons, Mechanic currently leds spoon carving workshops across the country in co-op shops such as Fort Houston in Nashville, TN and Craftsman Ave in Brooklyn, NY. Taught by Rachel Denbow of Smile and Wave! Rachel Denbow, author of DIY Woven Art and several creative skills e-courses, is a fiber artist with over eleven years of experience in the maker movement and DIY industry. Wanting to work with natural fibers in her woven pieces led to an interest in the natural dye process, which has spilled over into teaching others the beauty of color extraction from natural resources. Follow her roadside foraging and dyeing adventures at @smileandwave on Instagram or find photos of previous workshops at racheldenbow.com. Learn to extract color from food waste items and take home a beautiful linen scarf OR set of linen napkins. You'll also take home dye samples from a variety of my favorite dyes and learn to document your process in your take-home dye journal. With an emphasis on food waste, this workshop sheds light on how easy it is to obtain beautiful colors from kitchen scraps before they go into your trash or compost pile. Madewell has kicked off their first ever Commons location on South Congress and they are making it a priority to consistently showcase local Austin artists in their store. Join us for a Saturday of Madewell meets Broad Studios, where you can shop their store and our handmade goods all in one afternoon. The six of us will be tabling everything from ceramics to jewelry to silk scarves to art. See you there! complimentary cocktails & light bites! Taught by Rhodalynn Jetton of Wildflowers & Flamingos! Guests can expect to learn the foundations of brush lettering and add their own authentic style to their lettering. We will work on technique as well as nurturing the creative process in a way that makes learning something new fun and rewarding. As we will apply our learned techniques to a completed, meaningful project that guests can leave our time with. You helped make this happen. Whether it was your moral support, cash money, manual labor, or (bless your heart) all three. Either way, we'd love to share the excitement about this new chapter of our lives with you. custom cocktails courtesy of Desert Door Distillery & Champagne Supply Co.
Broad Studios tees & stickers! Join Madewell as they kick off their first ever Commons location on July 31st with a weeklong celebration including free denim personalization c/o Ft. Lonesome and Ace Tailors, sips, snacks, shopping and so. much. more. Oh, and did we mention that you'll get a free limited edition tote with any in-store purchase? 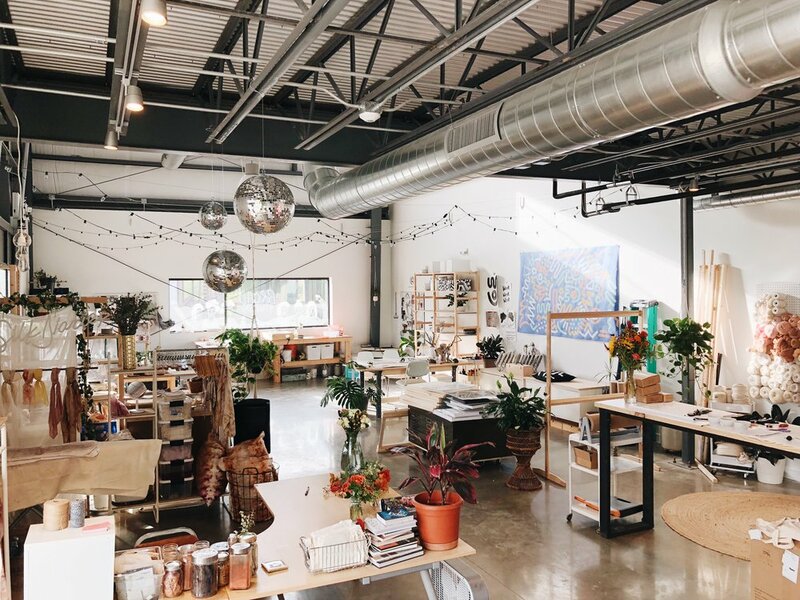 Join female artist collective Broad Studios inside the new Madewell Commons as we chat about entrepreneurship in the maker-slash-art world, what it's really like to collaborate and how we navigate the creative process. Moderated by Emily Eisenhart.